This new favorite find of mine has truly freed up so much counter space and has eliminated the mess of multiple plug outlets, seven cords going all of the place, and a spot to truly keep all the boys phones to make sure they are turned in at night! I know what you’re thinking, isn’t this a food blog? Well, yes it is, but after posting on my personal Instagram and Facebook about how much I love my charger, I got a lot of calls and comments about it, so I thought I would share this with you so I could help out your charging problems too if you have them! Not many of you probably have seven children like me, but I am sure you have several devices in your home that need to be charged at once. What I do know, is that if you don’t have a device similar to this one, you probably have the constant problem of not being able to find the charging cords or you don’t have enough space to keep all of them in one place too. I am a firm believer in not letting my kids have devices in their bedrooms at night, so we have one designated spot (some people like it in their master bedroom so the kids can’t sneak them at night) where all the phones have to be turned in before the kiddos go to bed. Good family rule! And with this charger, the kids don’t take the cords with them, ever!! So no more lost cords or wondering where you’re going to charge the phones. It has truly been the best solution for us. There are many chargers available but we liked this one because it could hold up to 10 devices. There is 4 retractable cords on the one side (2 Android + 2 Apple) and then there is 6 USB chargers on the other side. It comes with 4 small cables so that will leave you with two USB’s left to put whatever cord you would like in there. You might have an older device with a different end (like an old iPad or iPod) so you can use whichever cord you would like. If you want more small 1 ft. cords, you can find them here too. FlePow Charging Station Dock, charge the way you like! Wanting To Find a Tide Way To Centrally Charge Your Devices? Hating The Mess Of Tangling Cables On Your Desktop? 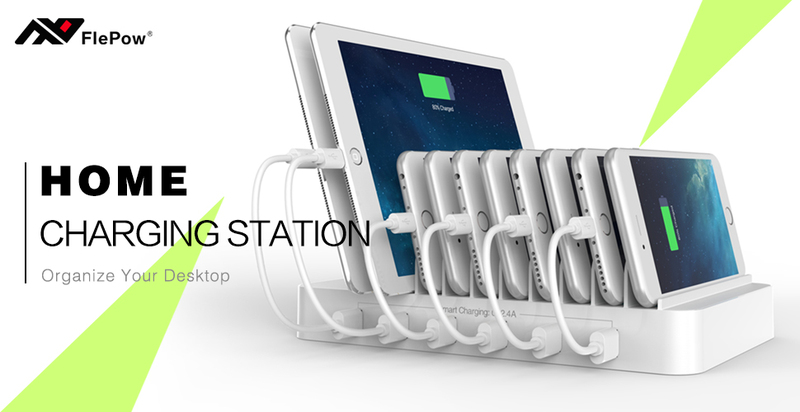 FlePow 10-Port Charging Station Is a Smart Solution For You! With Patented Designed 4 Built-In Retractable Cables. 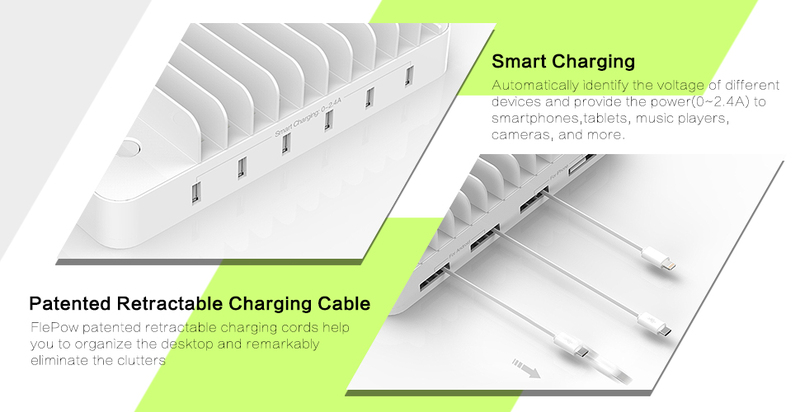 Organizes And Charges Up To 10 Devices For You Simultaneously! The innovative retractable charge cable set you free from searching for you cable. Just pull out the built-in cable and immediately charge your device! So if you’re looking for the best multi-device phone/pad charger ever to contain all your devices in one, nice, neat space for charging, this is it!! Click here to find on Amazon – I promise it’s worth it! !